One of the great joys of watching the State of the Union is when the camera pans to the other politicians in the room to show their reactions to what's being said. There was plenty of that this time around, and some of the best reaction shots came courtesy of a man who, if things pan out for him, will be giving his own State of the Union address in a year's time. 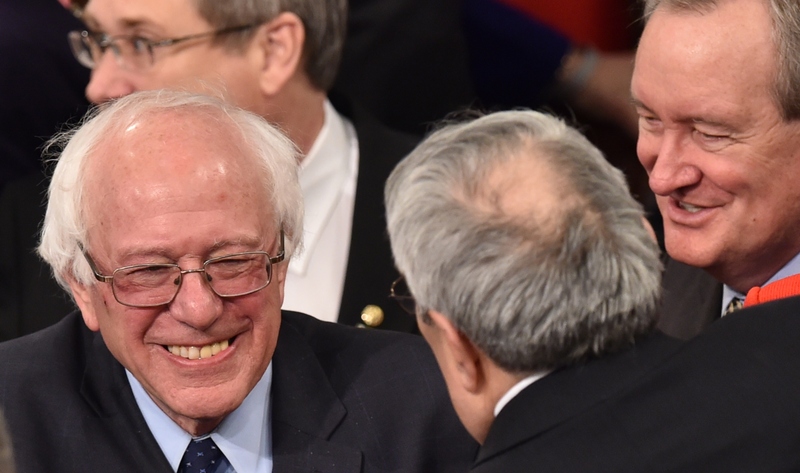 Bernie Sanders' SOTU reactions were a delight, and reinforced the grumpy-but-lovable-grandpa thing he's had going on for, well, his entire political career. Being a guest at the State of the Union is risky. Sure, every one of them is, by definition, an historic event. And yet, at any point during the address, a camera operator might suddenly decide to cut to a shot of you and broadcast it to an audience of millions. It could happen when you're picking your nose. It could happen when you're texting, or smirking to yourself inappropriately, or forgetting to applaud something that you probably should be applauding. None of those fates befell the Democratic socialist senator from Vermont, but Sanders' reactions to Obama's speech were still sufficiently entertaining. For example, here's the face he pulled when the rest of Congress was applauding Obama's call to change "outdated regulations." Sanders, an outspoken proponent of regulations, didn't look pleased. Granted, he rarely looks pleased, but he looked even more displeased than normal after that one. At one point, a scowling Sanders removed a mysterious piece of yellow paper from his jacket. I think it looks like the receipt a mechanic would give you, but the denizens of Twitter had some other theories. Here's the closest that Sanders came to looking happy during the address. Never change, Bernie. Never change.